Distribution & Habitat: Asplenium nidus is native to east tropical Africa, temperate and tropical Asia and in Australasia. Asplenium nidus can survive either as an epiphytal or terrestrial plant, but typically grows on organic matter. This fern often lives in palm trees or bromeliads, where it collects water and humus in its leaf-rosette. It thrives in warm, humid areas in partial to full shade. Description: Asplenium nidus gets its common name, bird’s nest fern, from the fact that its shiny, undivided fronds are arranged in an upward-spreading, bowl shaped rosette. These apple green, slightly undulate fronds may grow up to 1.5m (5 feet) long, but are more often about 45cm (18 inch) long by 5-8cm (2-3 inch) wide. Each one has a dark brown central rib that narrows and fades to merge with the colour of the rest of the frond for the last third of its length. For the first few weeks, new fronds, which unroll from a central spongy, fibrous, dark brown core, are delicate and easily damaged. Brown spore cases are arranged in herringbone fashion on the backs of some of the mature fronds of the plant. 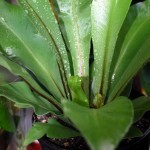 Asplenium nidus does not produce offsets. 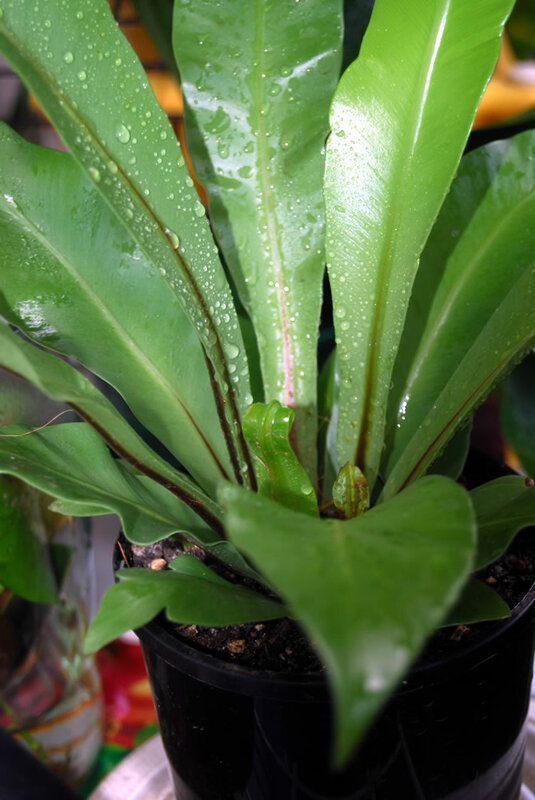 Proper Care: Protect Asplenium nidus from overwatering or exposure to hot dry conditions. The key to a healthy Asplenium nidus fern is providing enough warmth and moisture. Keep them moist, but not wet. It is a slow growing plant especially when grown indoors. The new fronds from the centre of the fern should not have the dust wiped off at this early stage. Harder, more mature fronds, on the other hand, will benefit from occasional wiping with a damp cloth. Light: These Aspleniums should be exposed neither to bright sunlight nor dense shade. Give them medium light all year long and keep these ferns away from droughts and direct contact with heat. A north-facing window if indoors will be ideal for Asplenium nidus fern. Temperature: All these species do well in normal room temperatures although they can actually withstand quite low temperatures. For Asplenium nidus, a temperatures between 16 and 21°C (61-70°F) is ideal with a minimum of 13°C (55°F). Provide humidity by keeping pots in a container filled with damp peat or sphagnum moss. Watering: During the active growth period water plentifully as often as necessary to make the potting mixture thoroughly moist. Water the potting mix, not the center of the rosette, otherwise it can easily rot. During the rest period water sparingly, enough to keep the potting mixture from drying out. It will not hurt these ferns to dry out for a while, but it is best to keep them evenly moist. Feeding: Apply liquid fertilizer to well established plants once a month during the active growth period. Potting and repotting: For a suitable potting mixture use a FERNS potting mixture. Aspleniums have fine, dense, black roots, which form very solid root balls. Repotting is needed only when the root ball becomes so dense and crowded that the pot is full of roots and obviously the plant is not absorbing enough moisture when watered. When this occurs, move plants into pots one size larger in the spring. The roots of these plants will often adhere firmly to the sides of a pot and in some cases it may be necessary to carefully break the pot to be able to remove the plant. 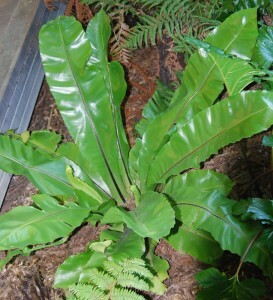 Cultivation: Asplenium nidus can be planted in the garden in a shady location with well drained soil rich in humus. Supplement garden soil with plenty of humus to allow rain or irrigation water to drain rapidly. This fern tolerates occasional dryness but grow best in soil that is continually moist. It thrives in humidity that is 40 percent or greater. The soil should contain enough nutrients for the fern. When plants are growing rapidly during the warm months, liquid fertilizer every two weeks can be used to support growth if desired. Avoid placing your Asplenium nidus where leaves can be damaged by passing people or animals. Remove old, brown and damaged leaves at base to maintain their loveliness. And watch out for slugs! Set the plant during the foggy, humid months to give them a boost. Asplenium nidus will tolerate dappled shade or morning sun. They will scorch in midday sun and fade in deep shade. In frost-free areas, Asplenium nidus ferns will tolerate cold temperatures in the -1°C (30°F) and even a bit of light frost. Alternativelly, Asplenium nidus can be cultivated on trees as epiphytes. Propagation: They are usually raised from spore or tissue culture, meaning propagation is usually beyond the reach of most home growers. Spores are produced only by mature ferns. Leaves will scorch if plant is in a draft or dry air. Treatment: Place the plant in a container filled either with damp peat or sphagnum moss. 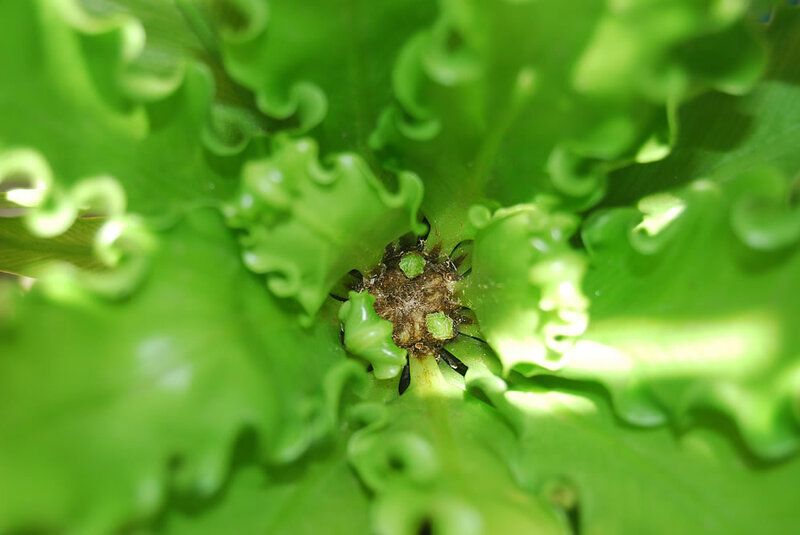 Scale insects may invade Asplenium nidus. 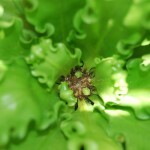 In case of infestation will appear little brown bumps on underside of leaves. Also, leaves may be sticky. Treatment: Spray the plant with soapy water followed by clean water. Root rot will have as result the following symptoms: no new growth appears, black flies may be around plant, soil might smell musty, leaves turn brown then black. Treatment: Take the plant out of old soil. Carefully wash off the plant and roots with a solution of dish soap. There is bacteria you must remove before repotting. Replant in new clean soil. If you are using the same pot be sure to scrub it with bleach or run through the dishwasher first. Leaf nematodes have as effect brown spots appearing near the center of the leaf near main vein and spread out to leaf edges. Treatment: It might be possible to kill the nematodes by raising plant temperature over 50°C (125°F). Fill the sink with water warmer than 50°C (125°F) and soak the plant for at least 10 minutes. Thoroughly wash the plant, a little dish soap is fine. Repot in clean soil. If you are using the same pot, send it through the dishwasher or scrub it with bleach first. Chemical insecticides will damage plants (use soaps if necessary). Usage: Asplenium nidus will make a wonderful centerpiece in any garden decoration, whether planted in a pot, container, hanging basket or even on ground. Makes a showy, unusual indoor plant, a stand-alone feature due to leaf length and strong leaf colour. It is an excellent as an accent in any landscape or rock garden. Being an epiphyte growing on large trees in the rainforest, parks or along roadways, it can be cultivated on trees growing in one’s garden to enhance the garden view. Asplenium nidus ‘Osaka’ is a beautifully rippled fern, a superb specimen for indoors or that shaded patio or garden area. It has lime green fronds, each up to 1m (3 feet) in length, which form a central rosette. Asplenium nidus Osaka is more tolerant in cold weather situations than similar fern types. Asplenium nidus Osaka uses very little water compared to many other plant varieties. Keep moist, but not wet. Fertilise monthly throughout the growing season.